The brief for the last time that I painted Necrons was straightforward. 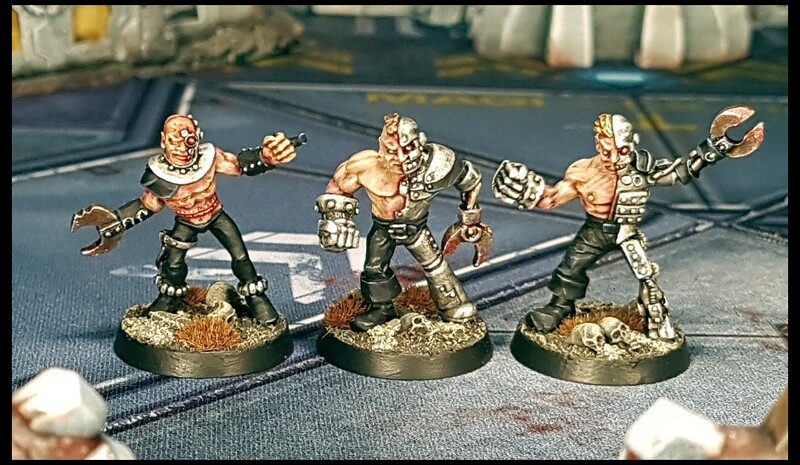 I needed enough figures to play skirmish games (about 20 or so), I wanted them to be uncomplicated to paint, I wanted to avoid green in the project palette and I wanted to evoke a little of the Terminator movie franchise. That project went pretty well, ending with 28 models painted in total. The paint job is simple and distinct by being quite bright and shiny compared to many Necron armies, plus it uses red rather than green as an accent. The shininess and the red accents tie the vibe to the “Terminator” franchise quite nicely. Sinister red-glowing eyes might be a cliché, but I reckon its a trope, and as a shorthand to get involved with theme, tropes are hugely desirable in toy soldier projects. Most of the figures that I have painted in this Necron drive have been efforts to fill out squads. Last time I just needed a handful of different types, whereas now I want to bulk out those units. Hence the two more Warriors above. The three cyborgs/infiltrators above were shown already, but I put them in the photos here anyway. Three Flayed Ones isn’t a full unit, but it was a fun start. 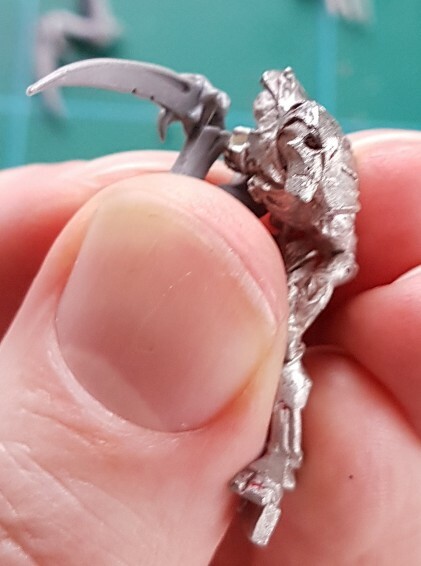 I was missing two of the six scissor style hands that the figures were originally supplied with, so I had to improvise with Tyranid Hormagaunt claws with a bit of remodelling to remove the more biological looking elements. A little bit of a T-1000 vibe wasn’t going to hurt in this context anyway. I was (temporarily) missing a chest piece to make a second Deathmark model, so I did a little silly but fun upgrade work on the old Space Crusade Chaos Android for a game of Kill Team. The goggles came from a plastic Space Marine scout kit. The rest came from a variety of Necron kits. Biclops turned out nicely when painted, and it really was quite fun to dig out a 28/29 year old figure and add some more recent bits to it. I have been experimenting with different ways to achieve the red elements, so there is some slight variation throughout the figures above if you look for it. I may go back and homogenise those at a later date, or I may not. It’s the nature of the handwavium powered weapons to cycle between different angstrom levels of turbulent juice illumination… or something. 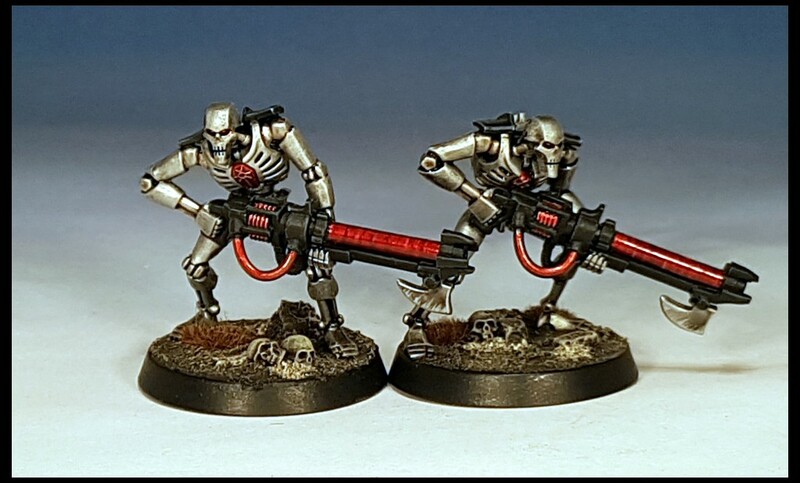 Last but certainly not least in this update is a pair of modern (-ish, 2011) Necron Immortals with Gauss Blasters. I really like how these guys simultaneously look slender, large and also dangerous. They are also quite fun to use in games I find. It’s easy to imagine units of these guys steadily advancing across a battlefield mowing opponents down under volleys of death rays (which definitely work in a manner an awful lot like the ray guns in Mars Attacks). That’s the lot for now, but there are plenty more to come. It’s impressive how you’ve seamlessly integrated models from a variety of ranges, in a variety of material and a 20 year age range. The consistent and tight metal-red-black palette has been enormously effective. I think BICLOPS holds his own, in spite of (by modern terms) being an awkwardly posed plastic figure produced from unsophisticated moulding processes. The added elements have done enough to conceal those characteristics. I still like to rattle out a conversion from time to time, even though I try to limit them for the sake of turnover. Kitbashing is more my thing (even though that’s a subtle difference really). Part of the reason that the Chaos Android is one of the more well liked of the Space Crusade models is because the moulding process that made the fig look a bit two dimensional actually lends itself to the concept. The figure looks awkward, with bow legs and arms pressed tight across the body, but that works with Harryhausen concepts of jerky reanimated skeletons, even if the skeleton happens to be a machine. The added on pieces help to tie it in with the modern range quite well I think. The rigidly applied palette is still settling a bit, but apart from the addition of a few fairly neutral flesh tones – disproportionately displayed in this batch – I don’t foresee anything in the army having additional colours. At its best, being rigid with the palette means that I can afford to mix the various eras of Necron, plus some other bits like Chaos Androids and the cyborgs together on the table without them looking too odd on the table. The space skellies are coming on great. I’ve always loved projects incorporating figures outside the base range and tasty conversions. Biclops works really much better than it has a right to. The cyborgs add some tasty flavour to the force as well, and the tight palette ties everything pretty wonderfully together. I rebased all of the older figures in the project over the last week or so, getting them to match the fairly dead looking, “Terminator” series future war scenes inspired ground that the new ‘bots are traipsing across. Matching the bases up is, as you of course know, an important element in tying disparate figures together. Although I have avoided using anything but human skulls on the bases of the rank and file Necrons, I have broken that rule for the characters. The newly based Hector Decimal features a genestealer skull on his base, in the hope that he will get to dice some of your cult this year. Extra points for using Chaos Androids! Awesome – all of the above, and extra-extra nerd points for the BASIC! My BASIC knowledge is pretty basic, but crappy robot jokes are in my wheelhouse. All aboard the serial bus, next stop: the C++ side! BICLOPS is awesome. He is clearly the unit leader… at least in his own head. After all, in a land of one eyed death robots, the two eyed death robot is king. BICLOPS possibly retained a shred more personality after his trip through the biotransference furnace than his colleagues. He can literally not keep the smile off his face. I do love them, and that’s quite a lot, Necrons not having been of my taste for long years. The conversions are perfect, and the colours you chose really give them a distinctive touch. Dammit, you are making me look at them with different eyes. I have found the Necrons appealing since they first appeared, but decided to go with other projects instead. Im glad that the Necrons time has come around though. Mad, megalomaniacal robots from space appeal to me a lot. 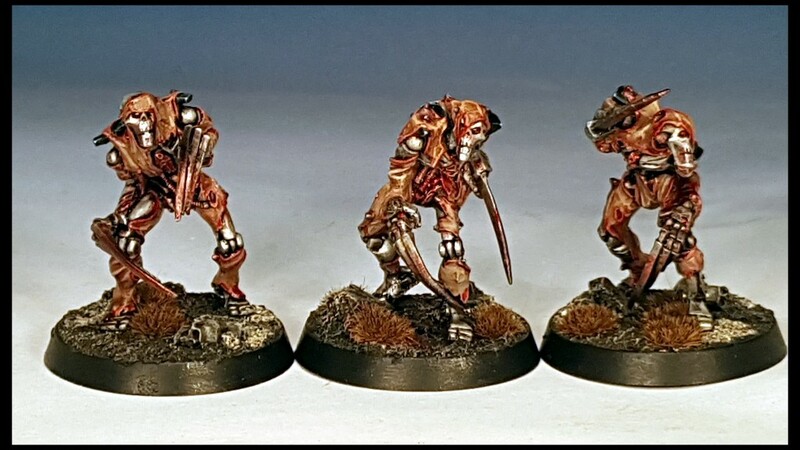 Nice to see necrons in some different colours. Even deranged, homicidal, robotic skeleton pharaohs need to keep up with changes in fashion and green was last millennium. I like the green look on Necrons, but it has been done to death, largely I suppose because of the clear green elements on the models I expect. Red isn’t exactly an inspired choice, but it definitely helps to give a Terminator feel. If I wasn’t going with a Terminator style, then I think that I would have avoided metal coloured chassis’ on the models. Gone with some sort of ceramic effect perhaps. But not the green, even if I do like the classic green and silver look, if I am objective about it. Stonking work, Paul! That Space Crusade conversion is especially impressive. Dun dunt dunt du dunt, dun dunt dunt du dunt, as the Terminator theme song says. 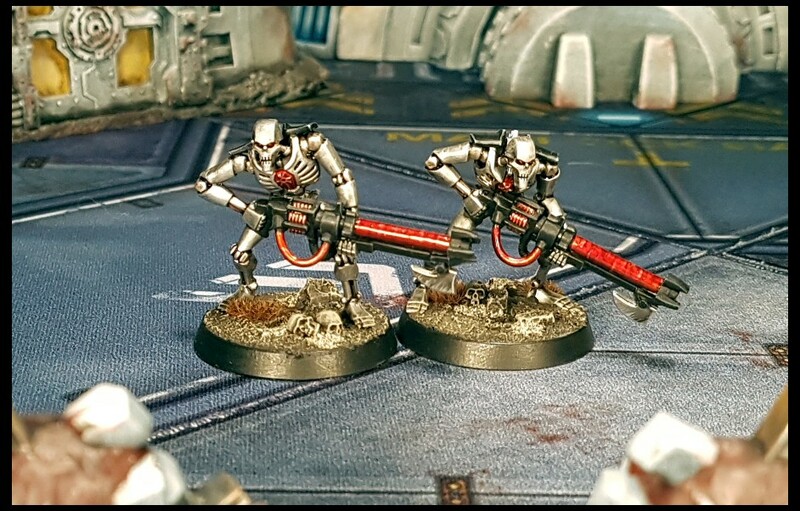 Very nice job on your Necrons there. The Terminator theme makes this force work for me. Terminator and Terminator 2 are big cultural touchstones, and all the more so if you were the right age to really get into those movies when they came out. I get more pleasure from projects that are informed from other media, which in turn helps me to stay focused and keep churning the figs out. Plus I get to do crap Arnie impersonations. I’m glad it’s not just me that introduces inconsistency between figures in an army-sized project and kicks the issue into the grass for a later date. My Crimson Fists have the vents on their backpacks either blue or silver depending on when I painted them – and I tend to rationalise it away as “Well, they’re actually real-world design variants”, or imagine that when the army’s done before a big tournament / game photoshoot that I’ll go back and homogenuous and tart up bits. Anyway, your Necrons are looking lovely as a fledgling force! Are you going to batch-paint large units of one type of figure from this point, or attack of multiple fronts adding minis to units here and there? What’s working for you getting minis through to painted? I tend to be fairly rigid with inconsistencies in a large project, but a certain amount of development in the process in inevitable. Add to that that some of these figures were fully or, in some cases, part painted since seven or eight years ago and its possible to see minor differences in a number of elements. But as I said, I’m not going to sweat it for now. I would rather have a *very* mildly inconsistent force ready for gaming, than a smaller force that is fractionally more consistent. So far the mix of models in batch painting has been good and bad. My batches have been too large, leading to some fatigue. I also crave having a few units that are completely finished, rather than several nearly finished. The thing is, because there is decent progress on a number of units, I feel like the army is taking shape better than if I had a smaller number of fully finished units. It means that rather than feel like I am bogged down in grunts, that I can justify painting some elites and characters. So the answer is that I don’t know yet, but I think that the variety in the batches is good for mojo maintenance. I am reaching a point where one or two figs here and there will finish units, so I may start to focus on those, to give me that finished unit endorphin kick. TLDR: the mixed figure batches are helping for now. Thanks for the feedback Curis! Nice post, and I missed using BASIC but I did have FORTRAN so I get it. Love the Terminator vibe. Red is really a nice tie together for the group. I’m glad that you like the Terminator vibe. It’s not a hugely inspired way to go with Necrons really, but even ruling out the green elements seen on Necrons so often makes the force a little less cookie cutter. Many more skelebots have been purchased, and some of them are already very close to finished, so it’s likely that a new batch will be posted here soon. Well the last time I used FORTRAN was in the mandatory class I had to take that ended in December 1980! Look forward to more of these, I consider them kin to my Warbots!